In 1775, Eliza Bloome’s ailing father dies and just a couple days later she receives notice that she has to vacate her home. Her father was a vicar and the home would be needed for his replacement. An Englishman who would soon inherit a wealthy estate expressed interest in marrying Eliza, but he was not the kind of man Eliza wished to marry. There was another Englishman she wished to marry, but he thought her beneath him. However, when his plans didn’t go the way he wished, he agreed to wed her and take her with him to America. Eliza’s maid, Fiona, went along. Things were going fairly well in America, though Eliza was unsure of her husband’s love, and she longed for it–for him to say the words. America was in turmoil and the Revolution began. Her husband had embraced America as his home and agreed that they should break free from the King of England’s control. So, just after Eliza gave birth to a daughter, her husband left to join the fighting. Nothing was the same after that. One tragedy followed another, and Eliza returned to England with no real place to go. This book has well-developed characters that I could empathize with. I cheered for them and cried for them, and my heart broke for them. There is romance, the struggles of war and the family’s the soldiers left behind, and there is loss, and pain and suffering. I couldn’t put the book down. It is the first in “The Daughters of the Potomac” series by Rita Gerlach, and when I reached the end, I found the end written well enough that it could be the end, but there was one thing that had not been resolved that my heart longed for. So, I immediately began the second book in the series. You’ll see that review soon. 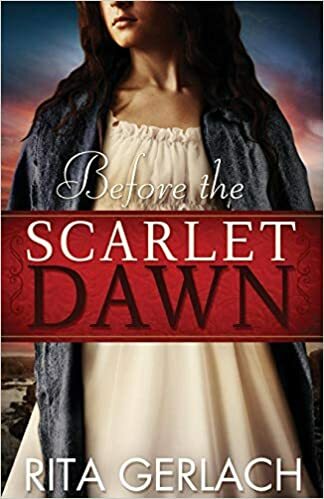 If you like historical romantic fiction, you will enjoy this story.